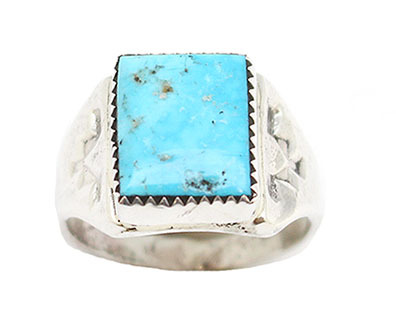 This cast sterling silver ring has one hand cut square kingman turquoise stone set in saw tooth bezel and has stamping on the sides of the shank. Top measures just over 1/2" long by just under 1/2" wide. 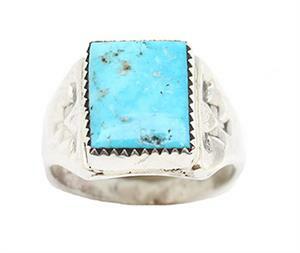 Native handcrafted by Navajo Artist Pauline Nelson. ***Only available in sizes 9, 11 1/2 and 12. *** Choose size(s) when ordering. Some have heavy matrix, not all clear as pictured.